ITALIAN PARADE: The Italian American St. Joseph Society parade rolls in the Quarter at 6 p.m. March 23. Shown here, marching club member Terry Villani, right, fits Kim Hammant of Metairie with a garter belt in 2017. 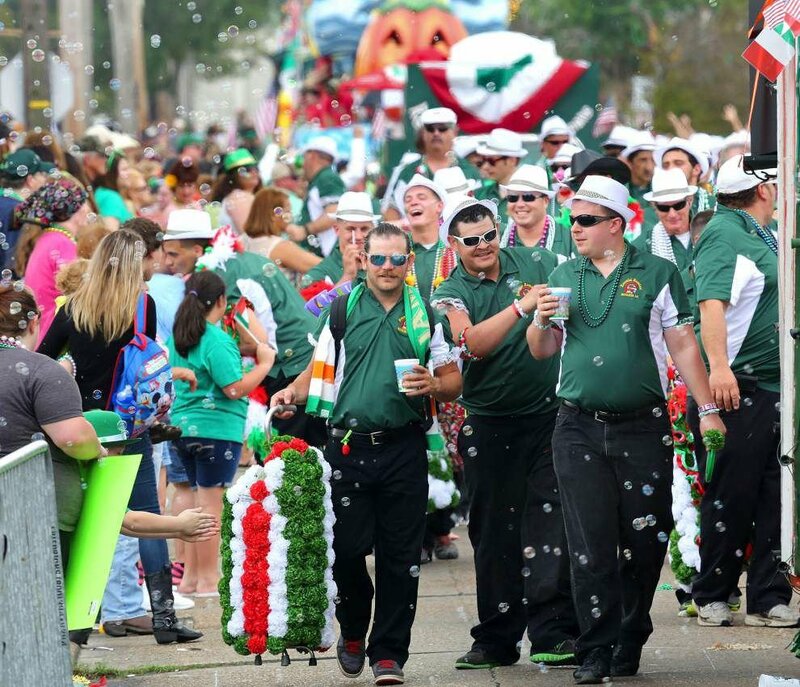 IRISH-ITALIAN PARADE: The joint parade rolls at noon Sunday on the traditional Metairie route. PUBLIC SPEAKING: JEDCO and the Jefferson Chamber will host a seminar at 8:30 a.m. Wednesday, March 20, at the Conference Center, 701A Churchill Parkway, Avondale. Cost is $5. Topics include overcoming fears of public speaking, presentations, PowerPoint and "elevator" pitch. Register at www.jedco.org. TOWN HALL MEETING: State Rep. Christopher Leopold, R-Belle Chasse, will host a meeting at 5:30 p.m. Wednesday, March 20, at the Belle Chasse Middle School Gymnasium, 13476 La. 23, in Belle Chasse. Dr. Shawn Wilson, secretary of DOTD, and Chip Kline, chairman of Coast Protection and Restoration Authority, will attend. For more information, contact (504) 393-5649. BEAN CONTEST: The Krewe of Red Beans will host "Road to the Final Fork," a cook-off to claim the "Legume D'Or" prize where more than 30 local restaurants vie for the title. Launching Wednesday, March 20, the public can sample and vote in pop-up tests, as well as sign up for $5 brackets, with proceeds going to local nonprofits. For information on where the pop-ups will be, see redbeansnola.com or call Devin DeWulf at (504) 520-9953. GARDEN SEMINAR: "The Gardens of Downton Abbey" will be the theme of the Friends of Longue Vue annual Spring Garden Seminar on Wednesday, March 20, at 7 Bamboo Road, New Orleans. June Mays will present at two seatings: a brunch at 9:30 a.m. and high tea at 1 p.m. Tickets are $75. Reservations required, and character dress is encouraged. Tuesday is the deadline for tickets. Visit longuevue.com. CHARITY FILM: Friends of the Cabildo will be screening the 2015 film "Big Charity: Death of America’s Oldest Hospital" at 5:30 p.m. and 7 p.m. Wednesday, March 20, at The New Orleans Jazz Museum at the Old U.S. Mint, 400 Esplanade Ave. The film series highlights films and documentaries that showcase New Orleans and Louisiana. Former employees of Charity Hospital will be on hand for the discussion following the showing led by Dr. Vivian Norris. Tickets are on sale at $10-$15 by calling (504) 523-3939 or visiting friendsofthecabildo.org. LPO CONCERT: The Historic New Orleans Collection and the Louisiana Philharmonic Orchestra will present a free concert in St. Louis Cathedral at 7:30 p.m. Wednesday, March 20. “Direct from New Orleans!” is part of Musical Louisiana: America’s Cultural Heritage, a series examining aspects of the state’s contributions to classical music. Seats are first-come, first-served, and live streaming will also be available on lpomusic.com and wlae.com. SENIOR HELP: A free program on enrolling in Social Security and Medicare will be held at 2 p.m. Wednesday, March 20, at the East Bank Regional Library, 4747 W. Napoleon Ave., Metairie. Maria Alvarez, public affairs specialist with the Social Security Administration, and Molly Prokop, counselor with the Jefferson Council on Aging, will present. The event is geared for people who are turning 65 (working or retired), those under 65 who have been on Social Security disability for two years, and people on Medicare who need clarification of their choices or plan. For information, call (504) 889-8143 or email wcsmith@jefferson.lib.la.us. FREE DIAPERS: Kenner's Department of Community Development will hold a diaper giveaway from 11 a.m. to 1 p.m. Friday, March 22, at the Hispanic Resource Center, 4312 Florida Ave., for families struggling with diaper needs. Call (504) 469-2570. Also, there will be registration for free booster seats while supplies last for those meeting guidelines. Call Collying Salinas (504) 888-9622, ext. 201. BIG PASTA: The Italian American St. Joseph Society will prepare the "world's largest pasta dish" in a free celebration at 11:45 a.m. Friday, March 22, at the Hilton New Orleans Riverside, 2 Poydras St., in the hotel's Grand Salon on the first floor. Wine and entertainment will also be on hand. PRAYER BREAKFAST: The Jefferson Prayer Breakfast will be at 7 a.m. Friday, March 22, at Copeland Tower, 2601 Severn Ave., Metairie. Tickets are $25. For information, visit www.liferesources.net. HOUSE TOUR: Six homes in the university area of Uptown will be included on the Academy of the Sacred Heart Alumnae Association Home Tour, Sacré Coeur Tour de Maisons, at 10 a.m. Friday, March 22. Proceeds benefit the association, including funding of the Sr. Shirley Miller, RSCJ Scholarship at the academy. Tickets are $25-$30. Purchase online at www.ashrosary.org/hometour or at Parkview Hotel, 7004 St. Charles Ave., on the tour. BRASS BAND BATTLE: Friday, March 22, is the deadline to apply for the annual Class Got Brass competition for high schools and middle schools to be held Sunday, March 31. The contest hopes to create traditional New Orleans-style brass bands (as opposed to marching bands). At stake are more than $45,000 worth of instruments for the participating schools’ music programs. For more details including the application form and guidelines visit classgotbrass.com. CHILDREN'S WORLD'S FAIR: A daylong cultural journey will be held Saturday, March 23, as the Louisiana Children’s Museum celebrates the 21st year of its Children’s World’s Fair -- and the last one at it's Julia Street location -- for ages 2-12. It looks at global customs through cultural performances and environments, games, music, literature, crafts, flavors and more of eight countries: Canada, China, Colombia, Denmark, France, Ireland, the Philippines, and Senegal. Admission ranges from $16-$100. Visit www.lcm.org. GREENWAY FEST: "The Hike: Tunes, Tales and Trails Festival" will be 11 a.m. to 6 p.m. Saturday, March 23, at the Lafitte Greenway Great Lawn, 500 N. Galvez St., New Orleans. The event includes food, drink and craft vendors, plus an array of musical entertainment and guided walking tours along the linear park. BRITISH MOTORING CLUB: All British cars and bikes are invited to the 29th annual British Car Day at 9 a.m. to 3 p.m. Saturday, March 23, at Delgado Community College, Orleans Avenue between City Park and Navarre avenues. For more information or to register, visit www.bmcno.org. ITALIAN PARADE: The Italian American St. Joseph Society parade rolls through the French Quarter at 6 p.m. Saturday, March 23. It begins at Canal and Chartres streets, runs through the Vieux Carre and ends at the Hilton New Orleans Riverside, 2 Poydras St. The queen and court, 15 floats, marching bands and over 500 kissing Italian American Marching Club parade marchers will process. LEGAL CONSULTATIONS: The Hispanic Resource Center, the Pro Bono Project and Ferriol Perez LLC will hold consultations on civil legal matters at 10 a.m. to noon Saturday, March 23, at the center, 4312 Florida Ave., Kenner. Income proof will be required. For information, call (504) 469-2570. LOUISIANA IRISH-ITALIAN PARADE: The traditional Veterans Memorial Boulevard parade route in Metairie will be the locale for the annual parade that rolls at noon Sunday, March 24, from the Clearview Shopping Center, 4436 Veterans Blvd. The parade will take the Severn Avenue loop and end at Veterans and Martin Behrman Avenue. MASTER DANCE CLASS: Phil Colgan, dance captain for the touring production of "Hamilton," will present two master classes for Rivertown Theaters at 9:30 a.m. Sundays, March 24 and 31, at Encore Studio, 1999 Hickory Ave., No. 102, Harahan. The first class is for students ages 10 and over, the second is for ages 16 and over. Tickets are $50. Register by phone at (504) 737-5977 or online at www.rivertowntheaters.com. DRIVER CLASS: A four-hour AARP Smart Driver class will be held at 5 p.m. Wednesday, March 27, at Ochsner/Elmwood Fitness Center, 1200 S. Clearview Parkway, Harahan. The class is open to anyone 50 and older, and those completing the course will receive a certificate that may qualify for discount from automobile insurer. The cost is $15 for AARP members, $20 for non-members. Call (504) 828-3962 between 10 a.m. and 4 p.m. for additional information and to register. "HOUSEWIVES" HEADLINER: Cynthia Bailey, entrepreneur and star of Bravo TV's "Real Housewives of Atlanta," will be the keynote speaker for the Urban League of Louisiana's 2019 Women-In-Business Challenge. The four finalists in the competition are Charon Flowers Maple of Designum Technologies, Sara Reardon of NOLA Pelvic Health, Leslie Barrow of Southern Comfort Real Estate Services and Courtney McWilliams of MaryMac's Doggy Retreat. The event is held during New Orleans Entrepreneur Week and will at 1 p.m. Wednesday, March 27, New Orleans Jazz Market, 1436 Oretha Castle Haley Blvd. Register at www.wib2019.eventbrite.com. For more information, call (504) 278-6439. HERB SALE: The Herb Society of America, New Orleans Unit, will hold its spring plant sale at 9 a.m. to 3 p.m. Saturday, March 30, at 8301 Olive St., New Orleans. Members will be on hand to help gardeners select plants for culinary and ornamental use. The sale will benefit projects of the New Orleans Botanical Gardens, Longue Vue Gardens, the Herb Society of America, New Orleans Unit’s educational programs and other local gardening initiatives. For information contact Linda Franzo at lindafranzo57@gmail.com or (985) 781-4372, or email herbsno@gmail.com. CHORAL CONCERT: The Jefferson Chorale, an affiliate of the Jefferson Performing Arts Society, and the Benjamin Franklin High School Choir will present "Pastorale," at 3 p.m. Sunday, March 31, St. Joseph Church, 610 Sixth St., Gretna. Dr. Louise LaBruyere directs. SCOUT RUN DAY: The annual Thin Mint Sprint and the 1-mile Daisy Dash will be held at 9:10 a.m. Saturday, April 6 at the St. Tammany Trace Trailhead, Koop Drive, Mandeville, open to all ages and the public. or more information, visit www.gsle.org/thinmintspringt. FESTIVAL FETE: Nicholas Payton will be the headliner at a fundraiser for the French Quarter Festival at 8 p.m. Friday, March 22, at the Fillmore New Orleans, Harrah's Casino, 6 Canal St. Other entertainment includes the Nayo Jones Experience, drumming by Mardi Gras Indians, A Tribe Called Gumbolia, dinner, drinks and a silent auction. Tickets start at $150. For tickets, see www.fqfi.org. ART & SOUL: The NOCCA Institute's annual gala will be at 6 p.m. Saturday, March 23, at the school, 5 Homer Plessy Way, New Orleans. On tap are entertainment, food and beverages plus a silent auction. Tickets are $50. For information, visit noccainstitute.com/artandsoul. CRAWFISH FOR COPS: Citizens Organization for Police Support in the NOPD 4th District will hold a crawfish boil fundraiser at 4 p.m. Saturday, March 23, at the Federal City Green Park on Gen. Meyer Avenue. Tickets are $25. For information, call (504) 444-2423 or email whiteela@aol.com.